Flare-ups can be scary. They start quickly and can present a direct threat to whatever food is on the grill. Typically caused by bursts of flames created by bits of oil or fat dripping off of the food, flare-ups essentially create grease fires. The two most common occurrences of this happening are when the food is first being placed on the grill and at the time when the food is flipped. Understanding how to appropriately react is an important first step when attempting to determine the seriousness of a flare-up. Flare-ups are fairly common when grilling. It is completely normal to see small flare-ups when you cook where the flames are minimal and don't reach the food. These are incidents that likely require no action by the griller. In a more drastic scenario, when the flames are reaching up to or surrounding the food, there are a few strategies you can apply to get your grill back under control. One can not understate the importance of temperature control when grilling. In a two zone setup, you have one side of the grill that is hot and producing direct heat, and the other side which is producing no heat. This allows for fairly easy control over the temperature your food cooks. If a flare-up occurs while cooking with the two zone method, remove the food from the side of the grill experiencing the flare-up and place over the unlit side of the grill. Once the flames have died down, move the food back over the heat source and carry on. This is a popular way to grill because it is an easy way to control the temperature the food cooks at and it makes protecting your food from rogue flames simple. If you aren't cooking on fire with two zones, or if you think the flames are just too dangerous to safely approach, then covering the fire and "suffocating" the air may be the way to go. Fires need oxygen to survive and cutting off the flare-up's supply will effectively extinguish it. As soon as you see a flare-up, quickly cover the grill. Track the flames by watching the flare-up through the air vents. Once flare-up is determined to be extinguished, it's safe to uncover and resume grilling. Try removing the food from the coals, so it does not get badly burned. Cover the grill as quickly as possible as to not waste cooking time. With that being said, there are times when a flare-up can be so bad you may have to wait it out patiently. Some foods benefit from a light char, such as steak. In this case, a mild flare-up may not be cause for concern. What's difficult is judging how big the flare-up will be and how long it will last because there is a fine line between charred and burned. Understanding the fat content of what you are grilling is important. This will give you a better idea of whether or not the fat from your food is going to continue to feed the flare-up or if it will go out quickly. Alternatively, sugar-based sauces or foods rubbed with spices will not char, but will go directly to burning. Avoid using a water squirt bottle on a flare-up. Water in this form will feed the fire rather than put it out, which can potentially make the flare-up a lot more dangerous. Squirts of water may create an ashy mess on your food or grill, and in most cases, it will not be enough to put out a flare-up. If the coals are not extinguished the flare-up will just come right back. Keep grilling area completely clear of any fat or oil that can start a real fire. Lastly, although any amount of fat or oil that could start a real fire should never be around the grill, it's always good practice to keep a fire extinguisher nearby in case the unthinkable happens. I've never used it and never plan to, but it's there, so I don't "burn down the neighborhood," as an old neighbor was sure I was destined to do. 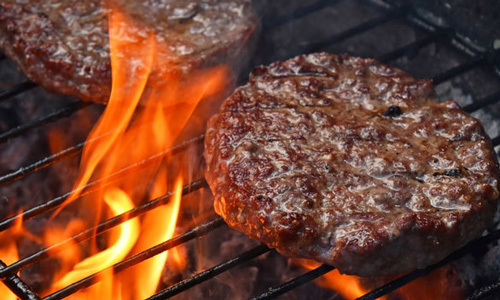 When it comes to the grill, safety is No.1 and the most important thing to keep in mind. There has been much advancement over the decades to enhance the grilling experience; those that give you unparalleled performance, and those that keep you safe when using raw energy that comes from mixing fuel and flame. Proper maintenance on your grill goes a long way and will keep your grill working smoothly. In this article we will look at some important maintenance tips, and how to prepare in the event of an emergency. The first tip to preventing grease fires and flare-ups is to clean your grill. Every grill has a drip pan and tray under its cooking grids and burners. When they become too full, and when the oil or grease has reached its maximum temperature, grease fires occur. These pans and trays are removable and should be checked on weekly. If you’re a frequent user of the grill, then check twice. When grill is OFF and preferably cool, slide the drip pan out of your grill. Scrape off grease and dried debris, and dispose of it. Under warm water, soak and rinse the drip pan. For a deeper clean, use a small amount of mild soap and a non-abrasive cloth; make sure you rinse well! When dried, place back on the grill. Monitor the grease levels in the removable drip tray at the back of your grill. Replace the drip tray when full, they’re disposable. Always scrape your cooking grids before or after every use, while the grill is still hot. Dried on meat and grease not only harbor bacteria and other nasties that can affect the outcome of your meals, but they can cause unwanted flare-ups. Using your grill brush while the grill is still hot is the best way to keep your cooking grids clean. But, you can also give them a good scrubbing with a soft cloth and mild soap when you clean your drip pan. Baking soda is the most effective form of fire extinguisher; it quickly cuts off the oxygen supply to the flame. Keep a box or 2 in or near your grill station, as well as a fire extinguisher. Salt will also work in smothering a flame. DO NOT use flour, or water ever when you need to put out a grease fire. It will explode and can severely injure yourself and damage your home. Grease fires are a rare and unexpected phenomenon and can happen to any griller on any grill, advanced or novice. But with proper maintenance of your grill, they should never happen to you. Just remember that you’re cooking with fire, so never leave your grill unattended. Besides, you don’t want to burn your steak, do you?